We are very excited to announce that we will be at Thessaloniki, Greece for the upcoming AMICAL 2017 Conference on 17-20 May. AMICAL is a consortium of American international liberal arts institutions, working together on common goals for libraries, technology and learning.It has been holding annual conferences since its founding in 2004. It brings together 27 institutions of higher education located in 21 countries across Eastern, Central and Western Europe, West and North Africa, the Middle East, Central and Southern Asia, and Russia. This year’s conference theme is “Centering on learning: Partnerships and professional development among librarians, faculty and technologists” and we are looking forward to learning from these fruitful partnerships. There will be two keynote presentations by the invited guests Christine Susan Bruce, Professor at Information Systems School at Queensland University of Technology, and Kristen Eshleman, Director of Digital Innovation at Davidson College. An overview of the program and the schedule are now available. Our VC session will combine meeting our two guests Christine Susan Bruce and Kristen Eshleman. The virtual buddy for this session is Maha Bali and the onsite buddy is Nadine Aboulmagd. Virtual connect virtually takes people to any where in the world where your voice could be heard and made useful. 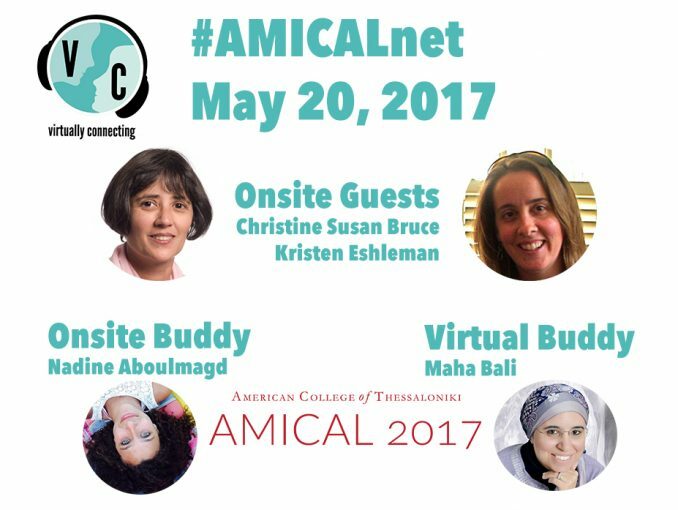 Very good to connect AMICAL 2017 virtually. Congratulations to the organizers.